The following publication was obtained from the website of the U.S. Naval Academy. DISTRIBUTION AUTHORIZED TO U.S. GOVERNMENT AGENCIES AND THEIR CONTRACTORS ONLY FOR OPERATIONAL USE TO PROTECT SENSITIVE TECHNICAL DATA OR INFORMATION FROM AUTOMATIC DISSEMINATION. 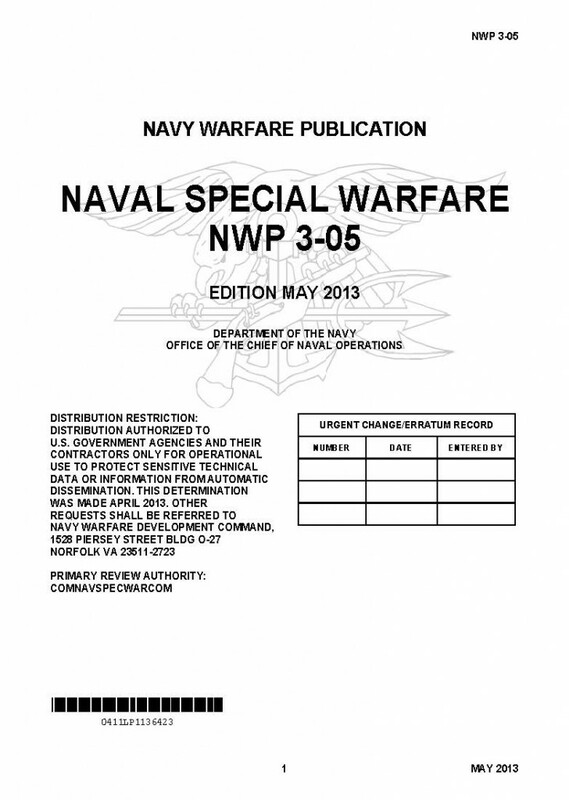 This navy warfare publication describes the nature, forces, organization, and employment of naval special warfare (NSW). Naval special warfare is a relatively small, maritime special operations force (SOF) consisting of approximately 9,250 personnel: 2,700 sea-air-land commandos (SEALS), 700 special warfare combatant-craft crewmen (SWCCs), 750 Reservists, 4,000 combat support (CS) and combat service support (CSS) personnel, and more than 1,100 civilians. NSW constitutes 11 percent of special operations forces and less than 2 percent of United States Navy (USN) forces. NSW costs 3/10ths of one cent (0.3 percent) of every United States (U.S.) defense dollar. underwater demolition teams (UDTs), and other special-purpose maritime organizations. In 1962, the first SEAL teams were established. Since 9/11, NSW has grown capacity and added substantial capability, including intelligence gathering and analysis, logistical support, and tactical mobility. three special boat teams (SBTs), and several supporting organizations. These teams and supporting commands are organized into six NSW groups, a training command, and a tactical development group. NSW is a versatile, maritime-focused, direct action (DA)-oriented force that emphasizes innovation, stealth, precision, and aggressive action. NSW capabilities are based on a rigorous all-volunteer training and selection process stressing mental and physical toughness for SEAL and SWCC operators. NSW tactical mobility assets include combatant craft, undersea combat submersibles, and tactical ground vehicles. Naval special warfare forces also include intelligence, surveillance, and reconnaissance (ISR); cultural engagement; and logistics support units (LOGSUs). These forces combine into scaled and tailored force packages that integrate intelligence gathering and analysis, a versatile portfolio of insertion and extraction techniques, flexible command and control (C2) options, and a strike capability characterized by attention to detail, stealth, speed, precision, and a high density of specialized skills. This chapter deals with the administrative, in-garrison organization of NSW. Deployed organization is described in chapter 3 and capabilities are discussed in chapter 4. Note that the terms “NSW forces” and “NAVSOF” are used interchangeably. NSW is the traditional Navy term, but NAVSOF is often used in the joint arena and is consistent with the usage in other Services: ARSOF for Army special operations forces and MARSOF for Marine special operations forces. NSW is a relatively small maritime special operations force consisting of approximately 9,200 personnel: 2,700 SEALs, 700 SWCC, 700 Reserves, 4,000 CS and CSS personnel, and more than 1,100 civilians. NSW constitutes 11 percent of U.S. special operations forces (USSOF) and less than 2 percent of Navy forces. which deploy forces worldwide to meet the requirements of theater commanders. 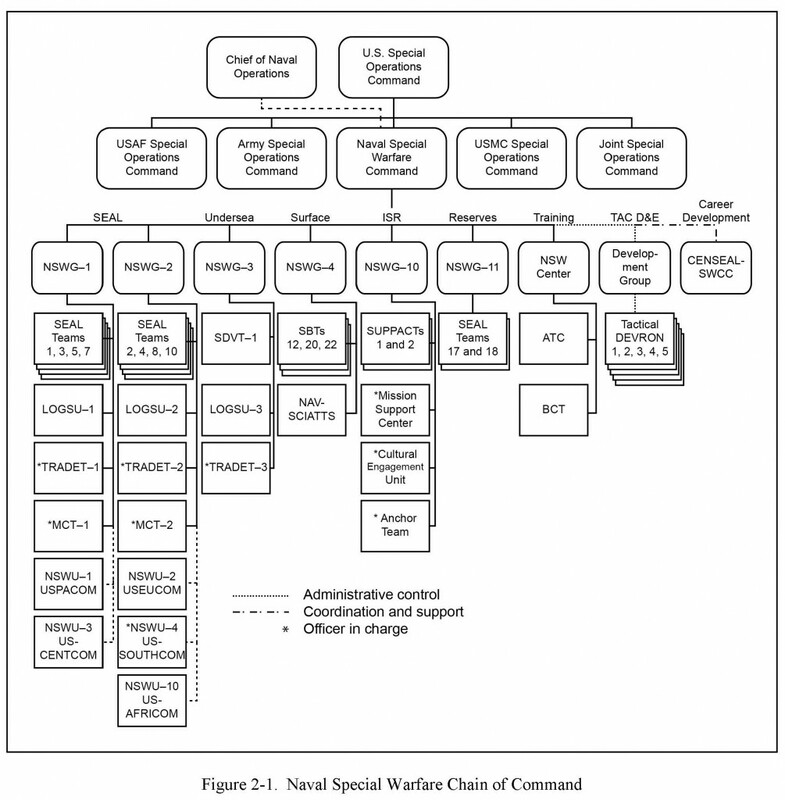 These commands are organized into six naval special warfare groups and a training command, Naval Special Warfare Center (figure 2-1). Commander, Naval Special Warfare Command, a two-star rear admiral headquartered in Coronado, CA, exercises OPCON and ADCON of all active and Reserve NSW forces stationed in the United States. The NAVSPECWARCOM mission is to man, train, equip, deploy, and sustain NSW forces for operations and activities abroad in support of combatant commanders and U.S. national interests. COMNAVSPECWARCOM is an echelon II command assigned under the combatant command of USSOCOM. As a Navy commander, COMNAVSPECWARCOM reports to the CNO for Navy-specific issues, including funding for Service-common systems, services, equipment, training, munitions, and materiel. Details of the responsibilities and relationships are delineated in a memorandum of agreement between the Navy and USSOCOM (see References section). Deployable NSW forces are assigned to one of the six NSWGs. SEAL teams are assigned to NSWG–1 or NSWG–2, undersea combat submersibles to NSWG–3, surface combatant craft to NSWG–4, intelligence support to NSWG–10, and Reserves to NSWG–11. An NSWG is an echelon III command under the OPCON and ADCON of NAVSPECWARCOM (echelon II). NSWGs exercise OPCON and ADCON of subordinate commands and assigned forces for COMNAVSPECWARCOM. The mission of the NSWG is to organize, train, equip, deploy, and sustain assigned NSW forces. NSWG commanders are Navy SEALs who hold the rank of captain and are accorded the traditional Navy honorific title of commodore.